Answer: The California Public Utilities Commission (CPUC). These failures all rest at the doors of regulators not doing their job. 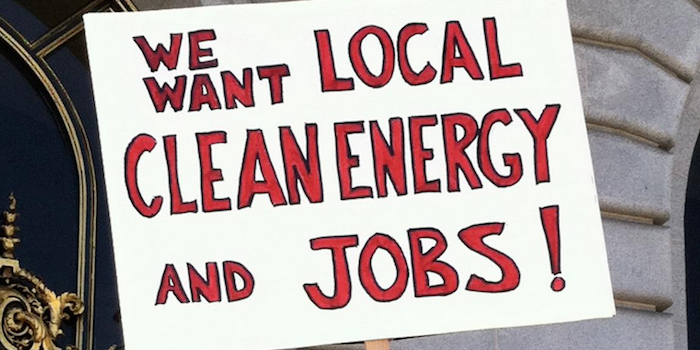 The job of the CPUC is to serve our communities, not the monopoly utilities. Yet the CPUC is fully “captive” to the companies it is supposed to regulate. The Result: The utilities are getting away with murder—literally. Click here to write your legislators to roll back the CPUC attack on our communities! California’s devastating wildfires set the stage for the CPUC to provide Pacific Gas & Electric (PG&E) a $6 billion bailout assist. Next, the CPUC will pass tens of billions in fire liability costs onto the public—propping up a monopoly utility the courts have found to be criminally negligent. These actions are just the latest in a long line of CPUC failures to protect the interests of the people of California. They also coincide with the CPUC’s latest attack—in a long string of attacks—on Community Choice energy, the state’s expanding alternative to the monopoly utility model. The CPUC recently approved a huge increase in a fee charged to the 11 million customers of Community Choice energy programs. The fee, called the Power Charge Indifference Adjustment (PCIA), makes Community Choice customers pay for “departing load” costs incurred by the monopoly utilities. These costs are due to above-market prices the utilities have voluntarily and unnecessarily paid for electricity, which they have to sell on the market at a loss whenever customers switch to more attractive Community Choice programs. Because the PCIA covers these losses, the utilities have no incentive to do better. In other words, the PCIA effectively shields the utilities from having to compete with Community Choice programs, The result: Community Choice customers are saddled with PCIA charges, and utility customers get saddled with over-priced electricity. This is the kind of mismanagement the CPUC is supposed to prevent, not promote. Both the fire liability bailout and the PCIA fee hike reflect the CPUC’s regulatory approach: socializing losses and privatizing profits. This approach rewards the state’s three private monopoly utilities, raises rates for all ratepayers, and attacks the state’s public, not-for-profit Community Choice programs – programs that are in the forefront of combating climate change. Click here to write your legislators to roll back the CPUC attack on our communities and on Community Choice! California’s 19 Community Choice energy programs provide important economic and environmental benefits to our communities. They lead the state and nation in demonstrating a successful decentralized alternative to the state’s faltering private monopoly utilities. Not to mention that they are way out in front in meeting climate objectives and developing innovative community-based renewable energy initiatives. Yet last October, in a move to undermine these programs, the CPUC approved a dramatic increase in the PCIA fees. These fees are arbitrary, unpredictable, and ongoing “exit” fees that all Community Choice customers must pay. PCIA fees continue indefinitely. It’s like buying an electric car and paying Chevron for every gallon of gas you don’t use. The CPUC’s dramatic fee hike is a handout to the monopoly utilities at the expense of all ratepayers. The damage to our communities has already begun, as Community Choice programs have had to put off launch, raise rates, and/or curb local investments. Make no mistake –the CPUC’s attack on Community Choice is contrary to law, obstructs progress toward the state’s climate goals, and fails to protect all electricity ratepayers. Through all these attacks, the CPUC is propping up an outmoded, centralized, private monopoly electricity model, based on derelict and now exposed corporations. It is obstructing the innovative, decentralized, public alternative energy model California is building to achieve a sustainable energy future. Demand that the CPUC immediately suspend the October PCIA hike, pending resolution of the procedural and legal deficiencies in the PCIA decision. Demand that Governor Newsom hold the monopoly utilities accountable and appoint new CPUC commissioners and top staffers who support Community Choice and prioritize community interests. Defeating the CPUC attack is essential to promoting a public alternative to the state’s monopoly utilities. For a more in-depth analysis of this issue—the CPUC’s decision, the impact, what’s at stake, and the response—see our Backgrounder: Roll Back the Attack. First and foremost, you can send an email letter to State legislators through the Alliance’s Action Network link. The letter will be sent to appropriate legislators, and copied to their energy staffers, the governor, and all CPUC commissioners. You can tailor the letter as you see fit, however keep it succinct (200 words max). Please share the Action Network link widely — with your friends, Facebook and Twitter followers. This is a campaign about numbers – the MORE constituents weighing in, the better. If you belong to an organization, urge them to support this action by signing on as an organization. Use the Alliance’s Action Network Petition. Encourage members of the organization to sign on individually at the Action Network link. Campaign 1-Page Summary: Roll Back the CPUC Attack on Our Communities! CalCCA -Press Release “Community Choice providers say time has come for PG&E to move out of retail energy business…”, February 14, 2019. CalCCA – Press Release “CalCCA Seeks Rehearing of CPUC’s Inequitable ‘Exit Fee’ Decision”, November 19, 2018. CalCCA – Press Release “CalCCA Statement on CPUC Approval of Controversial ‘Exit Fee’ Reforms”, October 11, 2018. CalCCA – Press Release “120 Elected Officials Urge CPUC to Issue Fair and Equitable PCIA Decision”, September 14, 2018.